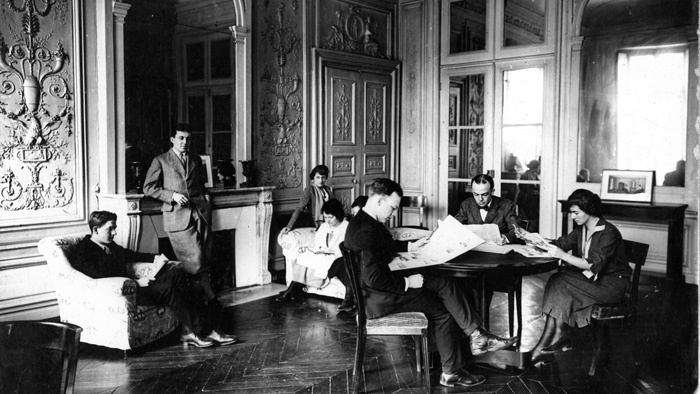 Parsons has had a presence in Paris since the 1920’s. Photo courtesy of the Anna-Maria and Stephen Kellen Archives at Parsons. Imagine beginning your studies in New York, then spending a semester or a year in Paris, Mumbai, or Shanghai before launching your career in New York. This is the vision The New School is planning for its students in the future—an educational path that is as globally oriented as the contemporary workplace you’ll enter after graduating. The first phase of making this vision a reality begins next fall, when the university opens an academic center in Paris for Parsons The New School for Design. “Design today is a global activity, and we want to be responsive to the local conditions that give design its flavor, its content, and its specificity,” said Parsons Executive Dean Joel Towers in an article that ran in the New York Times. Parsons Paris will operate in an intimate, atelier-like setting on rue Saint-Roch in the 1st arrondissement, near many of the city’s important cultural destinations, including the Louvre and Musée des Arts Décoratifs. The school will offer undergraduate, graduate, and study-abroad programs that reflect the areas of study at Parsons in New York but contextualized for Paris, taking full advantage of the city’s cultural resources. The undergraduate programs to be offered are Fashion Design, Strategic Design and Management, and Art, Media, and Technology; the graduate programs are Design and Technology, Design Studies, Fashion Studies, and the History of Decorative Arts and Design. Parsons Paris will enroll an international mix of students, who will study with a faculty of French and European art and design educators as well as visiting professors from around the world. Students will be able to supplement their coursework with classes in other subjects, studying online or at The New School’s New York campus. In addition to Parsons Paris, the university is developing projects in Mumbai, Shanghai, and other major urban centers. You can learn more about these activities and study opportunities in Paris by visiting the Parsons Global Learning and the Parsons Paris pages.